#MySundayPhoto 18/01/2015 - A freezing cold park trip! Before E was born four months ago, we used to take C to the park almost every day. We slacked quite a bit after her birth as I found it a bit difficult to get both kids sorted and out of the house in optimum time (I like to go before the school kids get out and the park gets busy) especially as neither of us drive. Regardless of the weather, I knew that we had to get C back out to run around. Despite it being icy cold, he had great fun playing. My aim is to get him out of the house as much as possible to blow off some steam! 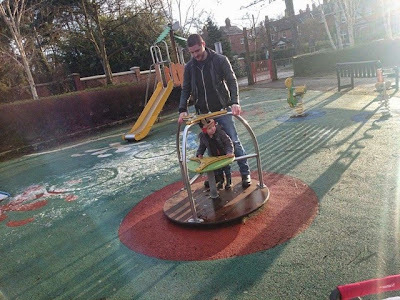 4 comments on "#MySundayPhoto 18/01/2015 - A freezing cold park trip!" It's great that you managed to get back outside and have some fun.